Under the new laws the period of bankruptcy will be reduced from 12 to three years. A NEW LAW that will reduce the period of bankruptcy from 12 to three years is expected to come into effect “imminently”, the Department of Justice has said. It follows confirmation yesterday that the first debt settlement arrangement had been reached between a borrower in the north west and several creditors under the country’s new personal insolvency regime. The deal saw some 70 per cent of the person’s unsecured debt written off with it expected to be the first of hundreds of debt write-off arrangements that are reached in the coming months. The Department of Justice has now confirmed that new bankruptcy procedures are “imminent”. It is expected that the Minister for Justice Alan Shatter will sign the necessary Statutory Instrument in the coming days, bringing the new law on bankruptcy into effect. Most significantly under the new measures, a person will be able to automatically discharge from bankruptcy after three years as opposed to the current 12 years. 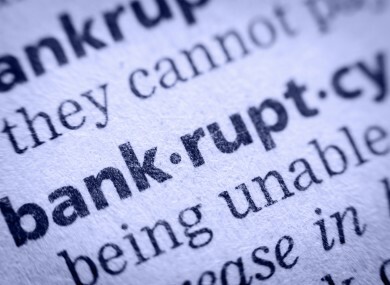 Bankruptcy is generally seen as the option of last resort where an indebted person, who is unable to pay their creditors, seeks to be declared a bankrupt. Their assets, with the exception of necessities, are then handed over to an official assignee who sells them and distributes the proceeds to creditors. Reducing the number of years that a person is in bankruptcy measures is seen as an attempt to stop the trend of ‘bankruptcy tourism’ which has been increasingly prevalent since the financial crisis. This is where Irish people have moved to the UK in order to avail of more lenient bankruptcy laws where a person can emerge from the process after just 12 months. Ross Maguire from New Beginning, which advocates for those in debt, said the introduction of the new bankruptcy procedures will “change the landscape completely”. “Now debtors who have either had their debt settlement arrangements refused or who are unable to do arrangements will have a mechanism whereby they can have all their debts written off,” he told TheJournal.ie. Maguire said that New Beginning expects around 5,000 bankruptcy cases a year in Ireland once the regime beds in. Email “New bankruptcy law 'imminent' following country's first debt settlement deal”. Feedback on “New bankruptcy law 'imminent' following country's first debt settlement deal”.